1. 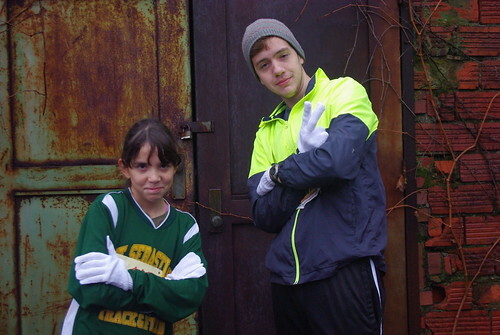 As has become our tradition of recent years, Rosie and Noah ran in the annual Run for the Homeless. 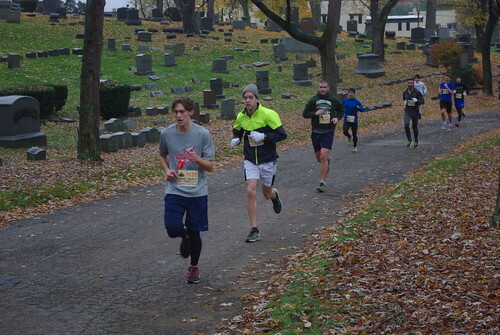 They, along with 1,966 of their favorite local running friends, ran the four-mile race from West Akron towards downtown and then through the historic Glendale Cemetery. 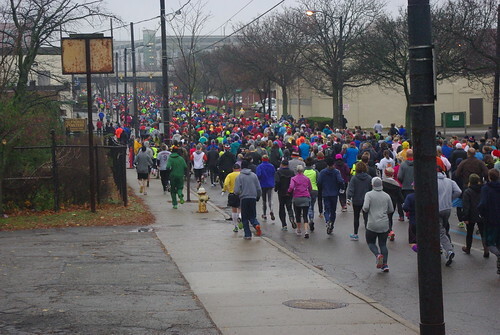 The day was brisk, but not too cold - great running and walking temperature. Noah told me ahead of time that he knew he wouldn't be PRing today (setting a personal record) or winning any awards. He's been dealing with a head cold for a couple of weeks and hasn't been working out as regularly. Rosie, as always, was in it to win it, or at least come as close as she could. 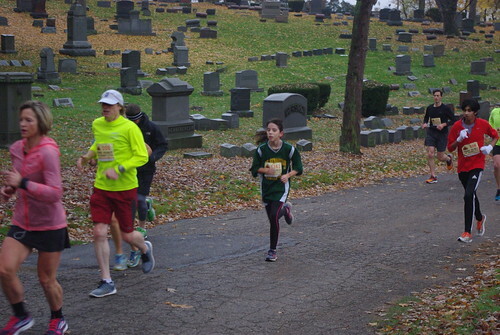 Mr. Pete, Izzy and I all watched them take off and then hustled down to the cemetery to catch as many glimpses of our runners as we could get! The course was a little different this year - some sadistic course director arranged for the maximum amount of hilliness!! It seemed to me that people were suffering more than in years past. 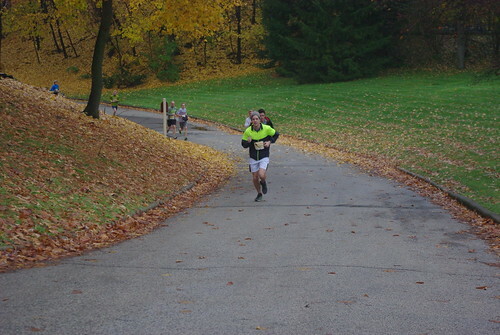 It seemed to Mr. Pete and me that Rosie had a shot at winning her age group. We saw a lot of men and boys go by, but not a lot of little girls. 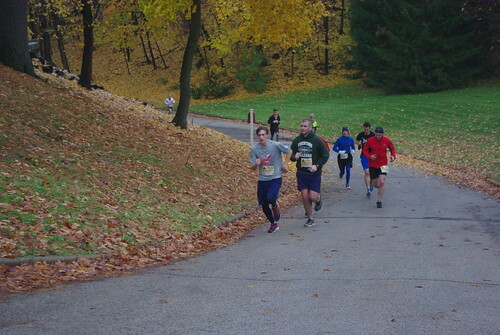 She had a time of 29:22 for the four-mile race. 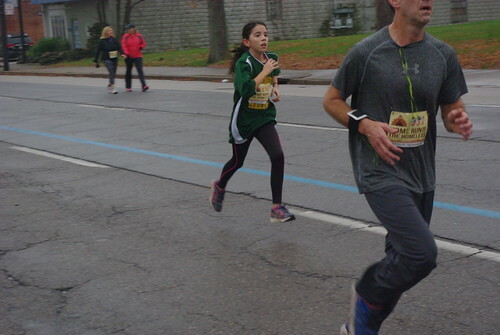 We listened as they announce 3rd place in her age group, and then 2nd place, and we knew she was faster, so we started to work our way to the front. 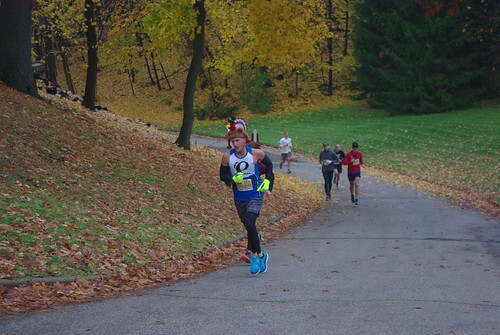 The announcer said, "And our first place runner in the 1-14 age group is Rosie LaVictoire!" Rosie beamed and Mr. Pete and I smiled at each other as she stepped forward to get her ribbon. But a lady came forward and had a very anxious and slightly angry look on her face. She and the announcer spoke together for what seemed like a long time. Different scenarios started running through my mind - I thought, maybe she was this guy's wife and she's mad at him for something else, or maybe she is in charge of the computer results and there was some kind of glitch, or maybe she was mad about some other result. I nailed it on the last one. She said her daughter had won the 1-14 age group, not Rosie. Of course, Mr. Pete and I weren't aware of anything, only that something was wrong. The announcer looked at us and said over the microphone. "There's been a mistake, and someone else has won the first place in this division, but we need to get that worked out, so Rosie, here is your ribbon and prize." He promptly handed her a blue ribbon with First Place on it and a big 20-pound turkey. The lady still looked angry. I can't say that I blame her. 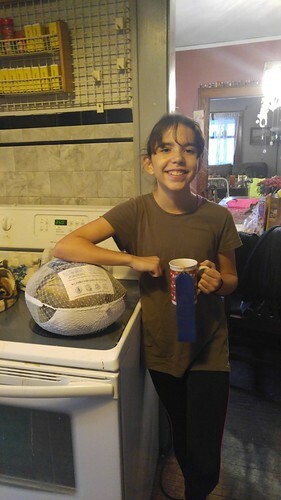 When I got home I checked the results and her 13 year old daughter did indeed have a faster time and should have won the ribbon and the turkey. Rosie should have been second. But I didn't know that standing there. Mr. Pete stood there holding the turkey, the announcer looked at us like he'd like to be anywhere else, and Rosie looked anxious and confused. Did I mention we were also in a room with a couple hundred people watching all of this? I guess on Monday, I'll call down there and see if we can make this right, maybe by giving back the turkey or offering to buy that girl and her family a different turkey for Christmas. If they could give Rosie a 2nd place ribbon I'd be happy to hand over this 1st place ribbon too. In the meantime though, we're still pretty proud of Rosie -and less confident about timed, chipped, computer results in sorting things out correctly. 3. 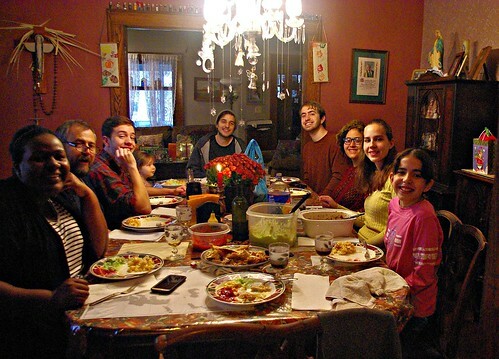 We managed to have 5 out of our 6 kids over for Thanksgiving, my son's girlfriend, our goddaughter ate with us and our godson stopped by. We only had my granddaughter for about 90 minutes, but she ate with us and of course everyone was delighted to see her. 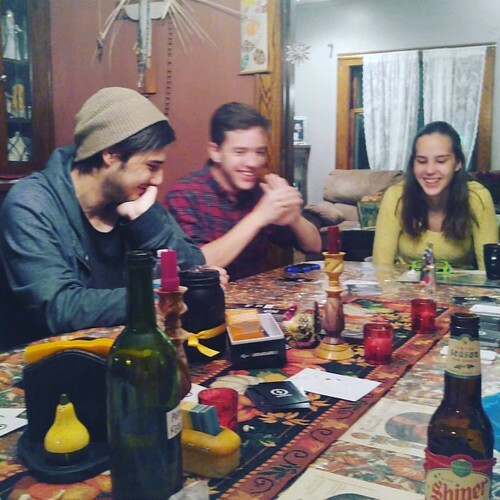 I managed to speak with Calvin and Sarah on the phone though, so I felt that overall, Thanksgiving was great! I just love watching siblings having a good time together! 4. We are also going to be going to Mr. Pete's 40th class reunion this weekend, and playing in a Christmas concert - this pre holiday stuff is always pretty strenuous. I have been stressing over what to wear to the reunion. I'd love to wear my mother-of-the groom dress again to get some wear out of it, but it might be too fancy for this event. I don't want to wear black. If I could, I'd wear black pants and a big sweater so that I could be warm!!! but I think I'll probably end up wearing a dress. My other stress is - what if I don't recognize everyone? People can change a lot over 40 years and I don't want to hurt anyone's feelings by not remembering them!! I'm keeping my fingers crossed on that one. 6. A few years ago, I started getting all of my Christmas shopping done before Advent starts. 7-I'm happy to announce that I am 1/2 way done with my Christmas shopping!! I just found that I could really focus on the spiritual preparations for Christmas if that was off of my plate! One of my son's wanted some sharp kitchen knives for Christmas and I was in a couple brutal e-Bay bidding wars for some nice Cutco knives until I finally won one of those auctions! In fact, most of my Christmas presents have been purchased online, from Amazon or e-Bay! I am looking forward very much to cyber Monday! 7. 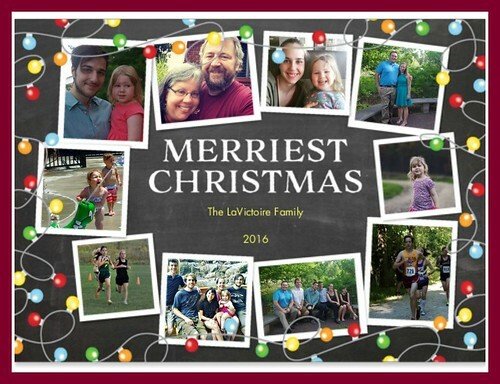 Oh, and I got my Christmas card designed, and ordered! Just waiting to address and ship! I'm feeling very accomplished these last few days before Advent. It's so nice to see families getting along! Love the Christmas Card!! !